Before I became a home stager and started my home staging business I moved often. I mean crazy often. As soon as my house was decorated beautifully, I’d be hungry for a new decorating project. That’s how I kind of fell into house flipping for awhile. The “worst” year (as my mother who never moves would describe it), was 2002 when I actually owned and lived in three different houses. And did I mention they were in different cities? The last one I had for only 6 weeks and flipped it because I realized I had moved to the wrong city. I still made something on it, purely because of my staging, and some simple cosmetic fixes to lighting and paint color. A “penny dropped” that day and I realized a had a knack for decorating houses to sell and my decision to become a home stager was made. In the 13 years since, I’ve only had 2 homes because I get my decorating and staging fixes working for my clients. I don’t have to keep moving for another house project to work on. I’m actually house hunting in two different cities, looking for a better climate and lifestyle for this phase of my life. This process is reminding me how critical home staging is for the way people house hunt today. In both cases, the agents have me set up in an automated system that chooses every listing that meets my location, price and square footage criteria. Logging into my account, there are 50+ possibilities in both cities. How do I wade through them quickly? I look at the online photos of course. Within 3 seconds, I make a judgement about whether that property goes into the reject pile with a click of my mouse, or the “favorites” which means my agent will book a showing. I think you can guess that the houses that look like crap, are rejected immediately. Unless (in my case) they’re right by the ocean and have a killer view. Then I’ll spend a little more time studying the photos. My Staging Diva brain takes over and I consider how much better I can make that house look with the right colors, furniture position, etc. But that’s because I’m a home stager. The average person won’t (or can’t) do that. With seconds to make a great impression, “looks” count for everything. There are so many powerful ways to educate your potential clients about why home staging is critical in today’s real estate market. If you’re already a Staging Diva Graduate, make sure you re-listen to Course 4 of the training program for the messages you’ll use when you’re talking to your 4 key target groups: home sellers, Realtors, home builders/developers and the media. Or, if you’ve haven’t taken my training program yet and you’re toying with the idea of decorating homes to sell, consider that it’s one of the lowest cost businesses to go into. I teach you how to do it without your own inventory. I show you how to grow your business without spending a lot on marketing, and everything in between. No matter what city or town you’re in, people always want to sell their homes faster and for more. Why wouldn’t they? That’s where we come in as home stagers. We make all the difference in those 3 seconds when a person decides whether to put the listing in the “reject” pile before ever seeing it in real life. And, we make the critical difference for potential buyers when they go to a showing and have to quickly rank it against the 6 other choices they’ll be walking through that day. Grab a free pass to a mini course I’m offering live by telephone conference call on Monday April 18. 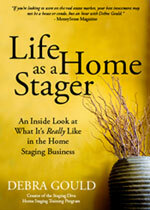 Wishing you every success in your home staging business, and this bigger thing called life. Let’s make the remaining 3/4 of 2016 awesome, shall we?